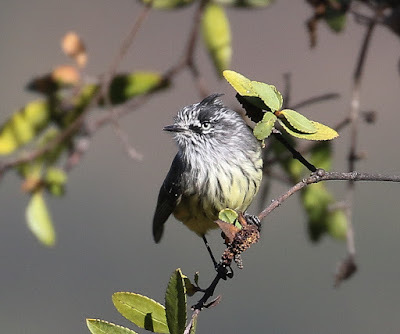 All too quickly, it was my last day of Birding in Chile. I decided to try & see the two new Chilean Tapaculos for me: White-throated Tapaculo & Dusky Tapaculo. Both occur at Parque Nacional La Campana, on the North side of Santiago. Moustached Turca also occurs in the park, but this was the only Tapaculo I had seen on my first short visit to Chile in Sep 02. The park doesn't open till 08:00 so I had chance to get breakfast before the park opened. I arrived to find a slow-moving queue of people trying to get into the park to go walking. I had been caught out by getting used to not seeing people while I was Birding & trying to get into a popular park near the capital on a Saturday. After a fifteen minute wait, I was finally able to get into the park. Fortunately, the other people were walkers & weren't going in the direction I wanted to go. I headed into the park until I could find a small path into the dry Chaparral habitat on the right-hand hillside. After a few minutes of walking into the habitat, I found a more open area & tried the recording of White-throated Tapaculo. 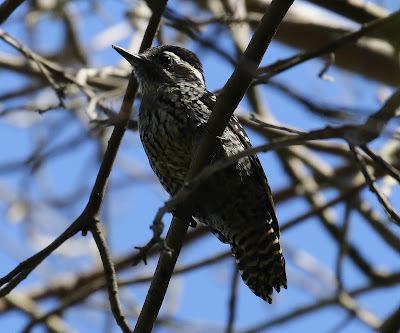 Within a couple of minutes, a White-throated Tapaculo had responded. It had already got hot & I decided I needed to push on. The next site in the park was the forest trails where I was hoping to find find a Dusky Tapaculo. 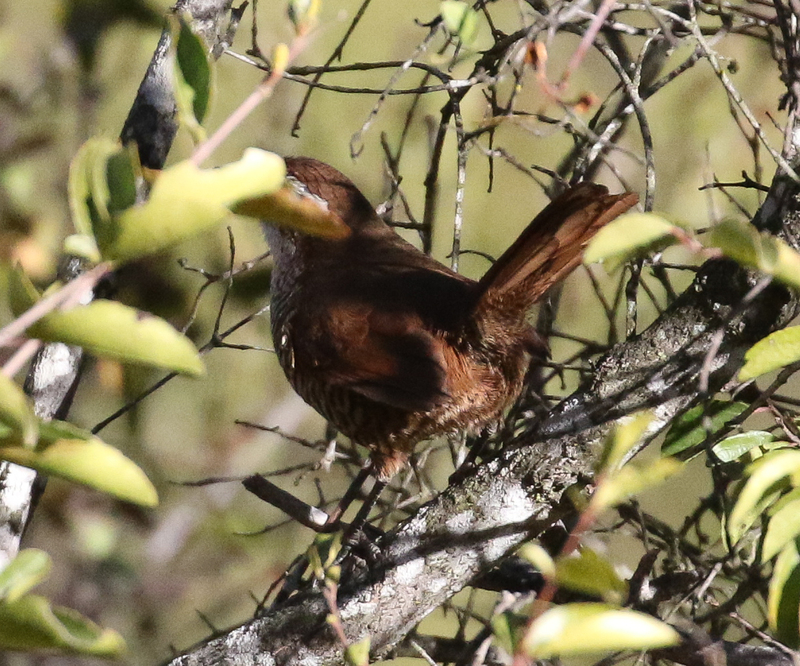 After a bit of searching, I managed to see my last new Tapaculo, but I failed to get any photos of it. Just after this, I bumped into a couple of American Birders who were the first Birders I had seen since the Arica pelagic. They had been at one of the nearby high-altitude sites, El Yeso, & seen a couple of Diademed Sandpiper-plovers. I hadn't been expecting they would still be around at El Yeso as they disperse from the central Chilean sites outside of the breeding season. It was now late morning & very hot. Time to head out of the park & find a cold drink. My plan had been to try a local reservoir on the way back to Santiago. I had seen on eBird, that a local Birder had seen a South American Painted Snipe at the site recently. It seemed a long shot, but worth a look. However, as I was driving back towards Santiago, I realised I should have enough time to get up to El Yeso. Given it was still really hot, I decided I didn't fancy walking around the reservoir site. 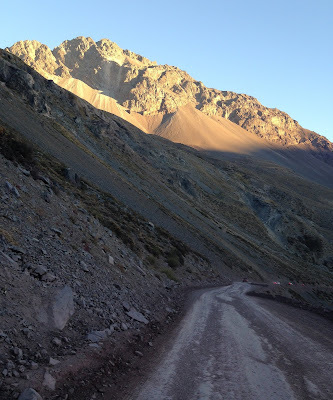 A quick check of the map & I was heading to El Yeso. It took a bit longer to get there than I had hoped, which cut into my time to look for the Diademed Sandpiper-plovers. It might have helped to have asked the American Birders for detailed directions, but visiting El Yeso hadn't seemed a realistic plan at the time. I tried all the obvious areas I could see & with more time maybe I would have been successful. It probably didn't help that a lot of other Santiago residents had decided to have a weekend's camping at the site. It was a cracking place to visit & will be on my route for my next visit to Chile. I had run out of time. I needed to head back towards the airport & the Hostal Sol y Luna for my last night. It was a bit tricky to find, but I found it in the end. After a final packing of the bags I was ready for my early morning departure to catch the early morning plane to Buenos Aires. I would have a six hour wait there before the late afternoon plane to Ushuaia. Trailfinders haven't been able to find a better connection. I had plenty of time to start entering all my Chilean sightings onto the laptop. Chile had been a brilliant trip & a good use of my time between the Colombian & the Atlantic Odyssey trips. I had seen thirty two Ticks on my second trip to Chile, out of a total of around forty five potential ticks. I saw another three new species from that hit list around Ushuaia within the next couple of days. 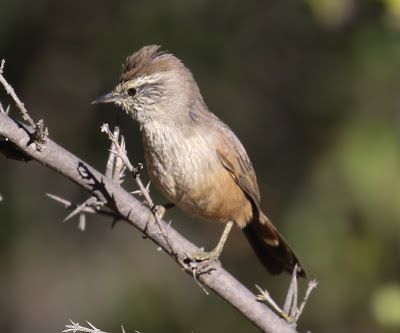 Many of the species I still need are either possible to see at the high-altitude sites near Santiago or are Peruvian overshoots into Northern Chile. So I have a reasonable chance to seeing them in the future, especially as I plan to return at some point to visit Easter Island & the Juan Fernandez Islands, which will mean passing through Santiago again.